Congratulations on taking the first step to optimal health and happiness. Place a measuring tape just above your hip bone parallel to floor. Be sure the tape is snug but does not compress your skin. 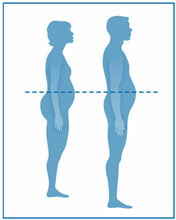 Relax and measure your waist circumference at the end of exhalation.